A 66-year-old woman presented with chest pain and had EKG findings consistent with inferior wall myocardial infarction (Figure A). The patient was taken for cardiac catheterization. 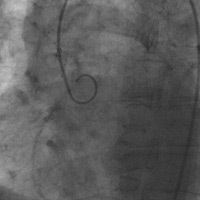 An aortogram failed to show a normal right coronary. 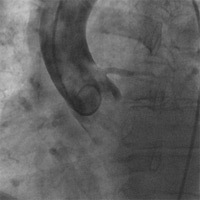 A normal left coronary was identified (Figure B). 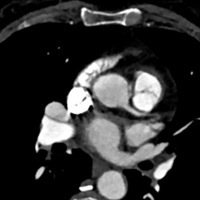 On delayed images, an anomalous right coronary could be seen filling from collaterals and tracking back to the left cusp (Figure C). A coronary CT angiography exam of the chest was subsequently performed; it confirmed anomalous origin of the right coronary from the left cusp and an interarterial (malignant) course of the anomalous vessel (Figure D). Anomalous origin of the right coronary from the left cusp with an interarterial (malignant) course. The patient was taken for coronary artery bypass and a right internal mammary artery to right coronary artery graft was performed, with anastomosis distal to the area of compression. Her proximal right coronary was ligated. Her postoperative course was uneventful. Coronary anomalies affect approximately 1% of the population. More of these anomalies are being incidentally discovered by multidetector CT. Anomalous right coronary from the left cusp with interarterial course (ARCA-L with IAC) was found to be the most common coronary anomaly by a recent large study. ARCA-L with IAC may be associated with sudden cardiac death, though less commonly than anomalous left coronary from the right cusp (ALCA-R). While surgical management of ALCA-R with IAC is standard, management of ARCA-L is more controversial. Age less than 30 years or presence of symptoms are accepted indication for surgical management. Management of incidentally discovered ARCA-L in an older patient is not standardized. Gated coronary CT imaging is an excellent modality to demonstrate anomalous origin and variant courses of the coronaries. One key variable may be the level of takeoff with respect to the pulmonic valve. In a recent cohort study, this was found to be a significant prognostic indicator. A high IAC was correlated with more major adverse cardiac events than a low IAC. A high IAC is felt to be significant due to greater compression by the aorta and pulmonary artery, rather than the lesser compression by the aorta and right ventricular outflow tract in a low IAC. However, our patient with a low IAC still was symptomatic. Medical management could be of more benefit than surgery for many older patients, and this deserves more study. The rarity of specific coronary anomalies necessitates large multicenter trials for adequate outcome evaluation. Multidetector CT is a valuable tool for such trials. — Erin Rowe, MD, is a radiology resident at the University of Connecticut Health Center (UConn Health). — Alex Merkulov, MD, is the section head for women’s imaging and an assistant professor of radiology at UConn Health. — Clifford Yang, MD, is an associate clinical professor of radiology at UConn Health.